The warriors have fallen. And those they previously protected must now band together to keep the invaders at bay. Mory, a young necromancer; Rochelle, a pregnant oracle; and Jasmine, a fledgling vampire, will do whatever it takes, whatever the cost, to prevent the fated future from unfolding. Even if that means they must become warriors themselves. 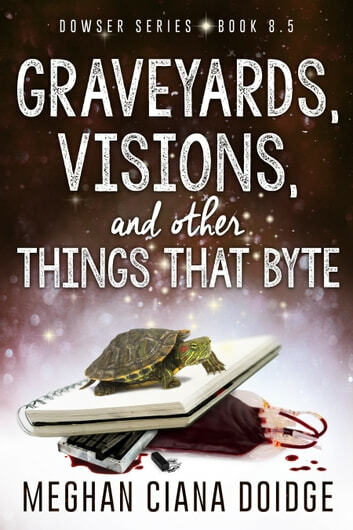 Graveyards, Visions, and Other Things that Byte consists of three novellas narrated by Mory, Rochelle, and Jasmine, and is set in the Dowser series. It is intended to be read between Dowser 8 and Dowser 9. Other books in the Dowser series to follow. As with all of Meghan's books this one jumped right to it. It is the kind of book I can't put down. When it is done I am thirsty for more and almost immediately missing the charactors . Can't wait for number nine! Couldn’t put down! I really enjoy getting to know the characters better. 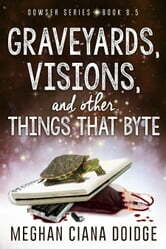 3 short stories that tie together Dowser 8 & 9, and I loved every minute! Each story from a different character, perspective, voice. Each character dealing with epic challenges. Can’t wait to start Dowser 9!! I love all of Meghan's books! Bytes was great with the way each of Mory's, Rochelle's and Jasmine's story's lead in to one another and then into what I assume to be the final battle between Jade and the elves. I love the strength of will each of these young women have. Its not just their individual magic that makes them special. Its the brand of snarky, toughness and great love they each have for their extended family. I await not just Jade's story, but the further stories of these three amazing women. Thanks Meghan for putting your heart and soul into these amazing stories.